Fiddleheads – I'll Make It Myself! Springtime is prime season for going to the grocery store and having no idea what on earth is on the displays in the produce section. 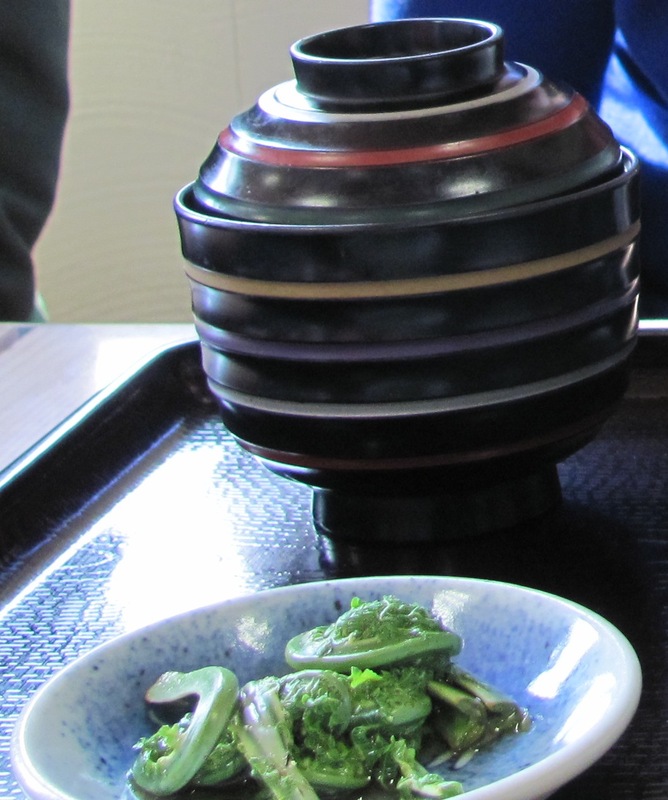 One item I did recognize was kogomi (こごみ) or kakuma (かくま), fiddlehead ferns, but only because I tried them last spring in a soba shop in Aizu, Fukushima. I saw them again on a pre-hanami grocery run in the city a couple weeks ago, so I decided to give them a shot. Lauren Ulm of Vegan Yum Yum recommends preparing them like asparagus, so I blanched them before sauteing them in a little butter. 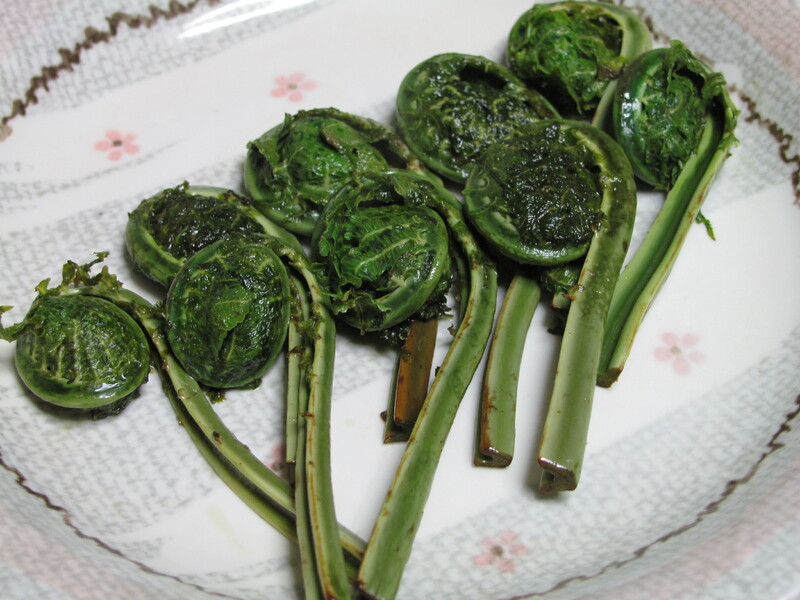 Although she doesn’t mention kogomi in the article, fiddleheads with other spring vegetables make great tempura, as Makiko Itoh of Just Hungry describes in her article in The Japan Times, and I often see them served in spring-vegetable soba or udon dishes. Finally, the shopping site Sansaiya recommends boiling the fiddleheads and dressing them with sesame, soy sauce, and sugar. Fiddleheads have a slightly nutty flavor and they make a good asparagus replacement in a meal. They should not be eaten raw, so be sure to cook them first. I’m hoping to have a chance to try cooking them in an entree before the season ends, but I ate these as a side vegetable to homemade falafel in pita (of all things). 1. Fill the bowl with cold water. Place the fiddleheads in the bowl and lightly rub the plants to remove any of the brown “silk” casing. Don’t unfurl the curly tips, but do push and rub them, since the remains of the casing tend to get stuck in that part. Empty the waste-water and set the fiddleheads aside. 2. Trim the stems of the fiddleheads. 3. Bring a small pot of water to boil. When boiling, add the fiddleheads and boil for about 5 minutes, until crisp-tender. 4. Remove the fiddleheads from the pot and drain well. 5. Heat butter in a small pan. When melted, add the fiddleheads and salt and toss well. Cook for about 5 minutes. 6. Serve hot. Keeps for about 5 days in the refrigerator. Pingback: Spring is Here: Na no Hana (Broccolini) « I'll Make It Myself!